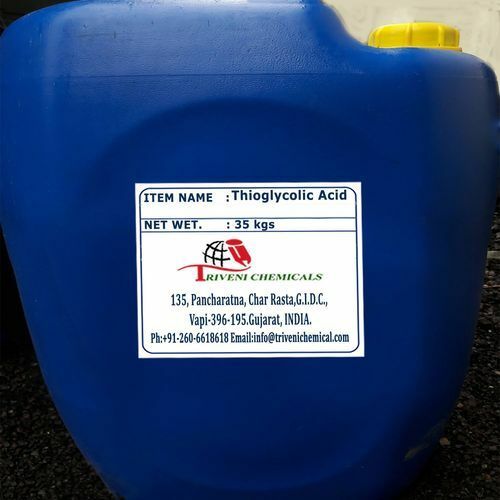 Thioglycolic Acid (68-11-1) is colorless, clear liquid. It is also known as Mercaptoacetic Acid.Thioglycolic Acid (68-11-1) is a colorless, clear liquid. It is also called as Mercaptoacetic Acid. It is available in multiple type of packaging. Triveni Chemical is one of the leading Suppliers of Thioglycolic Acid. Storage: Keep container dry. Keep in a cool place. Ground all equipment containing material. Corrosive materials should be stored in a separate safety storage cabinet or room.